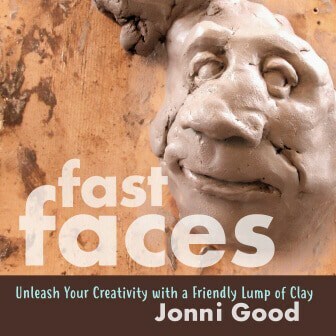 My new book Fast Faces: Unleash Your Creativity with a Friendly Lump of Clay is now available on amazon.com. It will be available on other eReader stores, too – just as soon as I can figure out how to do that. 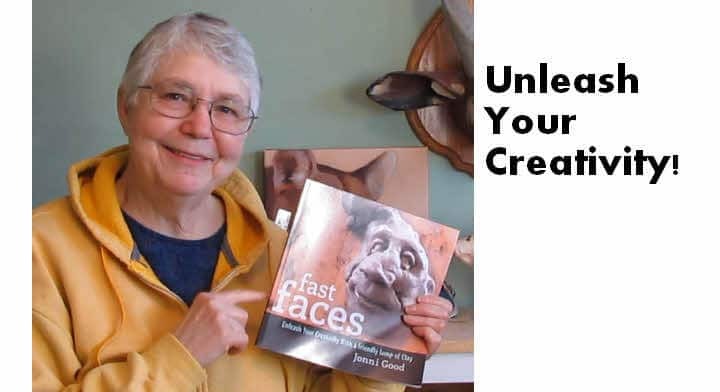 I woke up this morning to find out Fast Faces was already the hot new release in the Sculpting Technique category. Wow – I had not expected that, but it’s pretty cool. The ‘look inside the book’ feature on amazon will let you take a peek at the first few pages. If you missed my previous post where I told you more about the book, you can find it here. I checked your book on Amazon, of course, I saw a “used copy” for $23.19. I found that puzzling and amusing because the book came out yesterday (and cheaper new). I need to get online and buy some clay. Thanks so much. HI Rex. I saw that expensive version, too. I think they buy the book from amazon, then add shipping and profit. A weird business, but maybe they make money. It’s probably all automated, too. I made a few changes to the book after you so graciously helped me find my worst boo-boos. There’s always just one more little thing you can do to make it better, but a deadline helps bring that to an end so people can actually get a chance to read it! Thank you so much for your help. Congratulations! I had already purchased the print copy before this post came out as I remembered you mentioning it would be out on Tuesday. I can’t wait to read/try it and I will be sure to write a glowing review. I really should read it first though. I hope this is a smashing success for you! Thank you, Eileen! And yes, please do read the book first. A review that’s written just to be nice to the author won’t give other readers any help, and they can actually stop potential from even looking inside the book. But I can’t wait to see what you think after you’ve had a chance to look it over, especially about the idea of having a ‘Fast Face’ party or workshop. I’m too introverted to do that myself, but I think it would be a lot of fun if the instructor understands the concept well enough so the students catch on right away. But you would know a whole lot more about that than I do, so I can’t wait to see what you think. Hi Jonni, I bought and read the book and it is a fun book to read. I love the part of people like me complaining about not having talent; that it is what we make of our own art as we see it , that is important; not what other people think. It is freeing in a way and I have been sating that for years. But, I have had to read that to really believe it. Thank you, I hope this book is a great success. Hi Candy. I took down my email signup form because so many people were signing up, and it started to get too expensive for me. However, you can subscribe to my YouTube Channel (click the little bell thingy so they’ll send you a notice when I upload a video). I also hope to start a Patreon account just so people who want notifications will be able to get them whenever a new post comes out. Thanks for asking! Candy, I learned I just have to “cowboy up!” and check the site. I don’t mean to be cheeky at all, but I learned you can’t rely on lists. I have empathy with you!